Since I started working for DAC it becomes almost habit forming to check out places to see if they are accessible. Partly because my Mum lived with me last year and had trouble getting around, and partly because the people I work with face these issues every day, but I am always excited when I find some destination particularly accessible. Which brings up an upcoming trip for me – backpacking. I will be going on a Boy Scout trip to Philmont in August, stopping at some pretty cool destinations along the way. As a prep, we did a shakedown backpacking trip a few weekends ago. Besides brutally pointing out just how out of shape I really am, (can’t lie about my ability on an uphill trail) I ponder how would you continue hiking and backpacking if something were to happen and you end up with a disability? I came across an article in the February 2014 edition of New Mobility magazine. A couple that was interviewed doesn’t let her use of a chair prevent them from hiking. 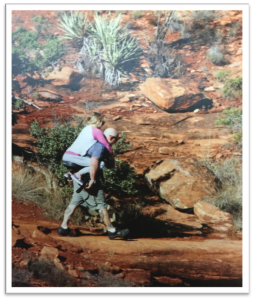 By using a PiggyBackPack a strong adult can carry a person with a disability by distributing their weight to their hips. These have been used by firefighters and rescuers to carry injured people out of the wilderness, much more effective than carrying in your arms. The pack is built for whatever you can carry. Comes with a backrest, harness, and under seat carrying pack. In the case I read about, he’s a strong man and can carry her (at 100 pounds) on any of the gnarly trails in Sedona, Arizona. Others have used this pack to allow their children with disabilities to go on hikes. There are also a number of wheelchair attachments that allow to go off road and travel at higher speeds. These after market upgrades allow you to take your chair on rugged, uneven surfaces. Whether you enjoy traversing a rocky trail with friends, or navigating snowy paths in the woods, or catching rays on a sandy beach, there is a way to do it. Some come with suspension forks and shock absorbers for help with stability.